There’s a new Maharaja in town, and you can bet young Nalayani is going to have words with him. The chief defender of her village once all the men went off to wage war with the Adversary, this woman is now looking for their leader’s help to ward off invading Dhole and secure their lives from the advances of unwelcome men. But what Nalayani doesn’t know is that this Maharaja has had a lot of experience with beautiful, brave, and accomplished women — and yet there are still a few surprises for him in store. 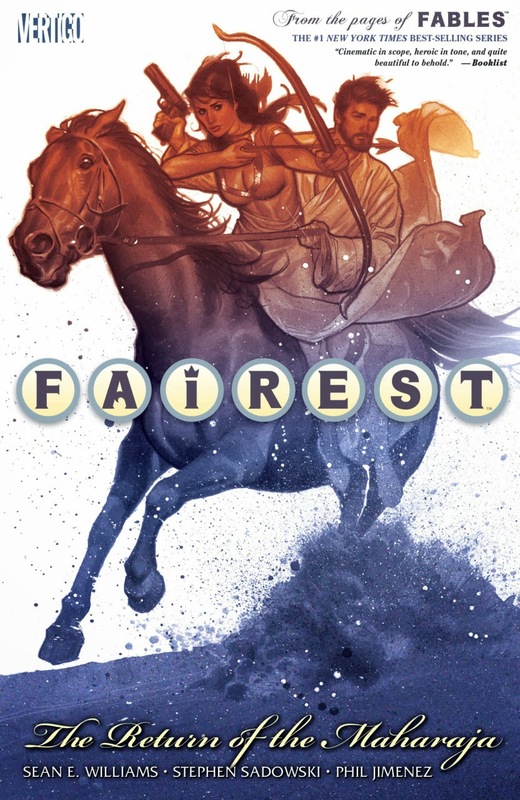 Fairest is not just a book about fairy tale women. It’s a book that repeatedly blends ethnicity with, and infuses LGBT heroes and heroines into, some of our most well-known tales. And it consistently does so in a way that is mature, clever, and entertaining. And this third story arc from the ongoing series serves up the best yet in that endeavor. Sean E. Williams weaves a really fun tale of the Hindu “princess” Nalayani meeting the man who would eventually fall in love with her. It’s a great table-turn for the man who becomes the new Maharaja, and while I am loathe to reveal his identity in spoilers, it’s fair to say if anyone can charm the pants off Nalayani, it’s this Fable. And yet, that’s the strongest showing of what this title does, in that the featured female protagonist is far from object. Her agency is in full force, and her destiny, even to the very end, is still her own to determine. This is thankfully not a tale where the lady swoons and is swept away to live happily ever after, but it’s not one that punishes her for her independence either. Not having much background in the Hindu myth that bears our heroine, I can’t speak to the effectiveness of Williams’ representation, but the fullness of Nalayani’s character and motivations is certainly realized on the page. She’s fierce without being cold, focused without letting herself ignore her own intuition, and more than anything, she’s self-taught and determined to evolve. Hard to find complaint in such a well-developed warrior figure, and even harder to dismiss the delight in seeing her in action across the page. The artistic partnership of Stephen Sadowski on pencils and Phil Jimenez on inks could not have found a more perfect subject than in Nalayani and her enemies. The young woman is rendered with such natural beauty, her Indian features well-chosen, and her stern expressions tempered by a virtual light in her eyes. And lest I forget, the guys aren’t so bad either. I’m pretty convinced the village hunter Bildeo was born full steam out of one of my most pleasant dreams. It’s no wonder he attracted the eyes of at least one of the young men in the story at hand. As the tale features a large animal cast as well, combining elements of The Jungle Book with local Indian folktale, Sadowski manages to make each character come alive without needing to anthropomorphize their appearance in the slightest. They feel utterly real as animals, and the addition of their intelligence does nothing to mitigate their physicality, as we often see in these types of stories. It’s a beautiful menagerie that’s wrought in these pages, and everything from horses to a massive crocodile is rendered with strength, beauty, and to my eye, physical accuracy. A fantastic follow-up to volume 2 that only expands the world of Fables to encompass even more diversity, The Return of the Maharaja is the first story told in this world in a long time that I feel deserves an immediate follow-up. Williams, Sadowski, and Jimenez should be applauded for the care they gave their lead, but more than that, they’ve managed to add to the world with such strength that it would be a shame to not see more of the same very soon.